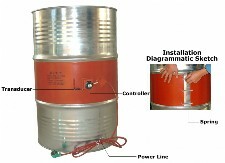 Drum heaters provide simple, effective and reliable way to heat contents of metal drums. Two or more drum heaters may be used on the same drum for faster warming. Not for "flammables." Do not use in explosion hazard areas. For metal drums only. For best results attach near the lower end of the upright drum. Attach to drum only in areas filled with contents. Do not attach heater above the liquid level.